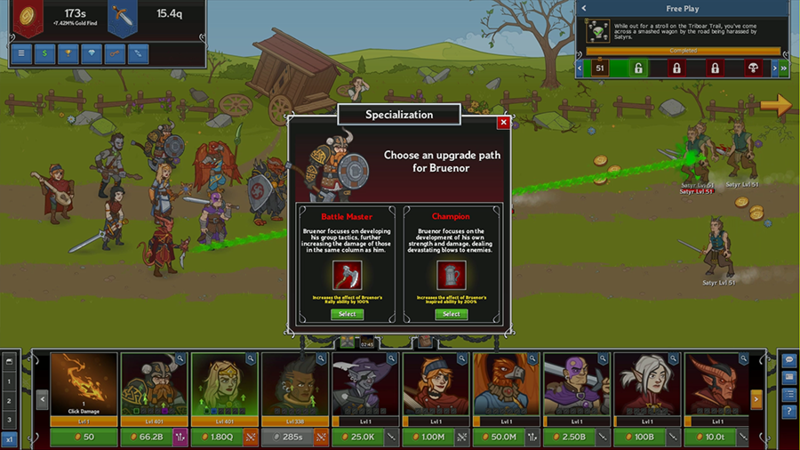 Tags: idle, champions, update, event, Feast of the Moon, Vlahnya, spotlight. Today, we're going to go into detail on our newest Champion: Vlahnya Um'vairar, the Eladrin Bard/Wizard who runs the Sirens of the Realms. Vlahnya will be available in our next Year Two Event, Feast of the Moon, which launches TODAY! I hope this blog will give you all you need to know about our latest champion. But don't forget that Feast of the Moon is also a chance to collect and gear up Gromma, the Tortle Druid who will be getting her annual tune-up in the upcoming tanking & healing update. Fate Weaver, Spy mistress, New Olamn college of whispers instructor, Band Manager of Sirens of the Realms & Magic Missile, long time pal of Durnan. This noble looking Eladrin Elf has friends in high and low places. Her true origins are unknown though it is rumored she traveled across Faerûn with a bard troupe and learned about the world one tavern at a time. Vlahnya is the leader/ Band Manager of the Sirens of the Realms. She is played by Satine Phoenix. Those with keen eyes may already recognize her from this year's Stream of Many Eyes, where Satine played Vlahnya during Ivan Van Norman's Off the Table sessions. Anyone who has ever met Satine has more than likely been overwhelmed by how OP her Charisma stat is. 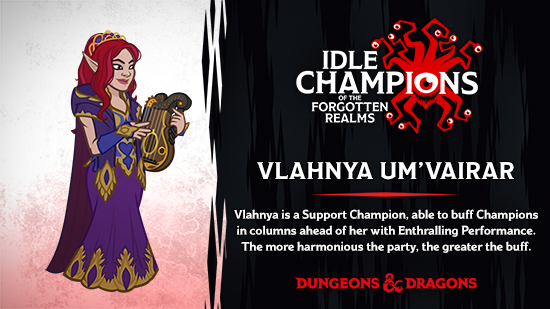 When we saw her play as Vlahnya at the Stream of Many Eyes in June, we knew Vlahnya could be an awesome presence within the Champions. We reached out to Satine and she was over the moon excited about bringing Vlahnya to video game life. As we do with any of our content creator Champions, we started our design by talking directly with Satine about who her character is at her core. Being the Band Manager of the Sirens of the Realms is one thing, but what sort of quirkiness could she bring to the champions? After an exciting conversation we landed on the idea that Vlahnya would take her role as leader seriously, staying back to debuff enemies and make sure the team was maximizing their capabilities. Base Attack - Mage Hand: Vlahnya starts by using her custom mage hand to slap an enemy and try to distract them. Formation Ability: Enthralling Performance: Vlahnya's main formation ability is a bit complicated, but it's a lot of fun to try to maximize! All Champions in the columns ahead of her increase their damage by 1% for each stack, based on the stacks of 3 notes that are above her head. 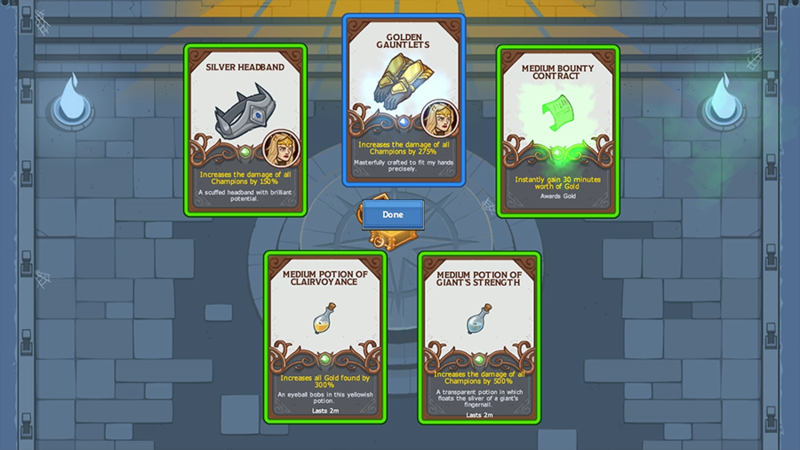 Building a formation and strategy that can maximize all three stacks will help you push further! Tempo Note: Tempo gains 4 stacks every time a Champion in the formation attacks. Bass Note: Bass gains 20 stacks whenever a Champion adjacent to Vlahnya kills an enemy. Treble Note: Treble gains 1 stack for each gold goober you collect. Each of the stacks diminish 20% every 10 seconds and cap out at 300 stacks per note. From left to right: Tempo, Bass, Treble; each note fill with a color as that note gains more stacks. 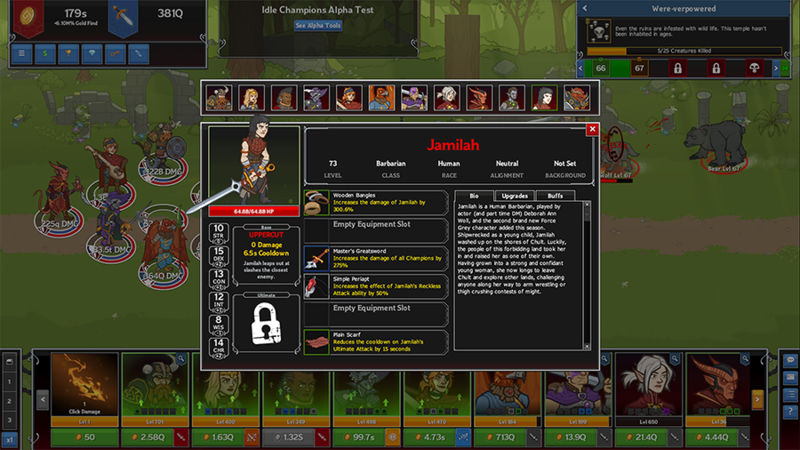 Formation Ability: Witch Slap: Vlahnya's Mage Hand now stuns an enemy when she attacks, in addition to dealing a bit of damage. Vlahnya's specializations are all about deciding whether she's focusing on being a solo artist, or getting the band back together. For Vlahnya's ultimate, we wanted to come up with something really unique. Something to fit her character. She has an Amulet of the Planes magic item, and who doesn't like a little Plane Shift fun?! 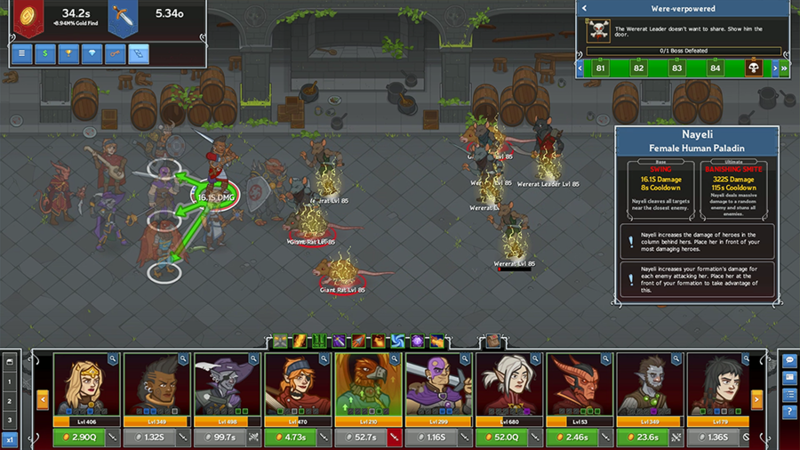 When Vlahnya uses her ultimate, she fey steps into the middle of the fray, and Plane Shifts away with up to 10 non-boss enemies. A few seconds later she Plane Shifts back to her formation slot. Where did the baddies go? That's Vlahnya's secret! 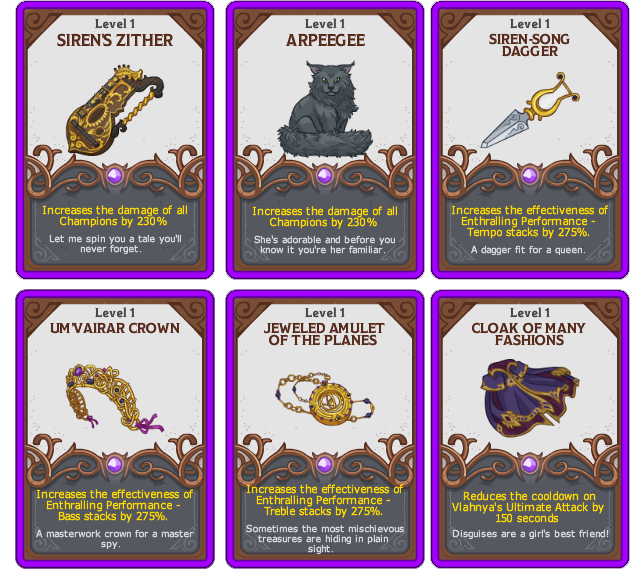 Note, that enemies that are Plane Shifted away do not drop gold, nor do they count towards quest objectives. 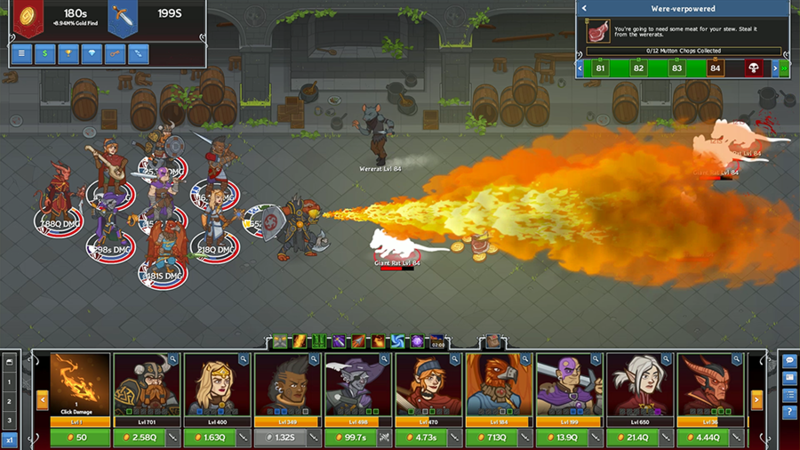 The ultimate is designed to help you clear the rabble away on boss levels or blocker levels to help your champions focus fire on their target. Vlahnya's signature instrument increases the damage of all Champions. Get it?! Vlahnya's Familiar also increases the damage of all Champions. Her dagger of choice increases the effectiveness of the Tempo note stacks of Enthralling Performance.. Her crown increases the effectiveness of the Bass note stacks of Enthralling Performance. Her amulet increases the effectiveness of the Treble note stacks of Enthralling Performance. Her cloak reduces the cooldown of her ultimate attack. What about any other Vlahnya details I'm looking for? Vlahnya is a master spy, and a strong leader. She'll increase the damage of those in front of her in the formation based on how well your formation is doing in 3 areas: the speed of your attackers, how often those around Vlahnya are dealing killing blows to enemies, and how often you are picking up gold goobers.